High quality dental care, focused on you! Dr. Ryan K. Staehling is an accomplished family and cosmetic dentist in Raleigh, NC who is committed to excellent dentistry. He strives to improve the oral health and general wellness of each patient through educative, non-aggressive treatments and care. His experience and patient-focused understanding are what keep Raleigh area smiles healthy and bright. Our dentist for Raleigh, NC is a native of Biloxi, Mississippi who began his dental journey when he graduated from Louisiana State University. Dr. Staehling has proudly completed many continuing education courses, including several courses at the Kois Center for Advanced Dentistry, an advanced endodontics course at the Scottsdale Center for Dentistry, and an in depth hand-on series of TMJ courses at the LSU School of Dentistry. He has also furthered his dental knowledge through many local and national conferences including the American Academy of Esthetic Dentistry and American Academy of Craniofacial Pain annual meetings. Dr. Staehling became a dentist in Raleigh after graduate school and feels it was the best decision he has ever made. He enjoys spending his free-time with his wonderful wife, Danielle, who is a Louisiana native he met while attending LSU. His other hobbies include rooting for local college teams and following LSU sports, exploring the outdoor activities of Raleigh, NC and the rest of North Carolina, traveling, and listening to live music. 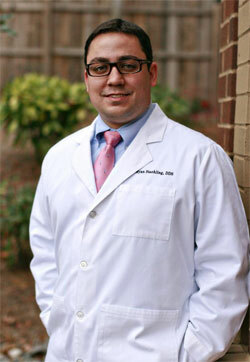 Dr. Staehling is an expert in family and Raleigh cosmetic dentistry and the surrounding areas. Contact the friendly team at Southern Dental Arts to schedule your consultation today. Providing dental solutions by a cosmetic dentist in Raleigh, NC for Cary, Durham, Wake Forest, Garner and Knightdale, NC.